Seems my Twitter feed is bursting with inspiration. 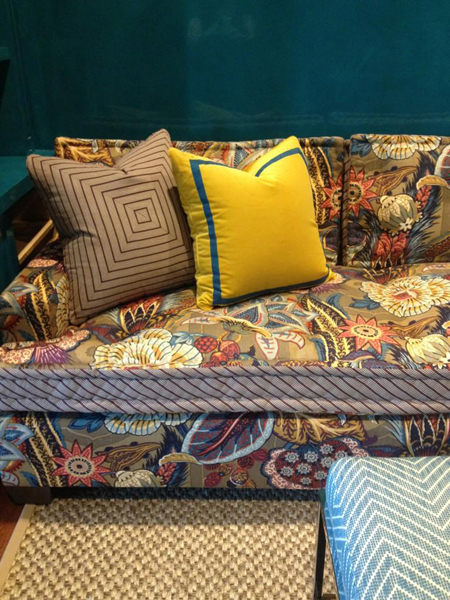 This week, I am majorly crushing on Tilton Fenwick's shot of a sofa they just installed that uses Schumacher's Zanzibar Linen in Cerulean accented with a thick border of Carleton V's Tamarack. The ladies say this sofa is part of a library that has blue lacquered walls! You know the rest of the room around this slice is bananas. And doesn't the sofa look so soft and comfy? Although Fall isn't officially here, I'm so glad to be past the Labor Day holiday so cooler temps can start rolling in - hopefully this month. I am so over humidity and heat! Though I should slow my roll on wishing the time away because I don't want December to sneak up on me too quickly - so much to do before baby gets here! Have a fantastic weekend...see you Monday! Lots of exclamation points!